When historian Goodwin was six years old, her father taught her how to keep score for ' their' team, the Brooklyn Dodgers, which forged a lifelong bond between father and daughter. 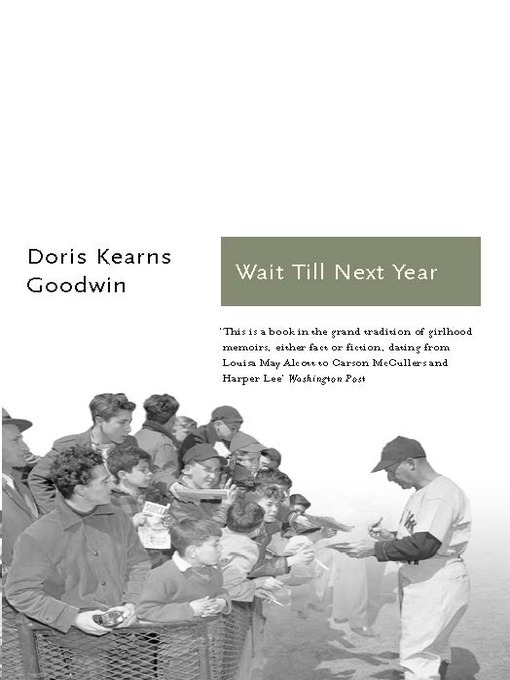 Set in the suburbs of New York in the 1950s, Wait Till Next Year is a coming-of-age memoir in the era of Jackie Robinson, Pee Wee Reese and Duke Snider, when baseball truly was a national pastime that brought whole communities together. With her radio by her side and scorecard to hand, she recreates the postwar era, when the corner store was a place to share stories and neighborhoods were equally divided between Dodger, Giant, and Yankee fans. Weaved between the games and the seasons, Goodwin tells the story of a changing America – from the lunacy of the Cold War alarm drills to McCarthy and the Rosenburg trials – as well as her own loss of innocence encapsulated by her mother' s death, her father' s lapse into despair and the Dodger' s departure from Brooklyn in 1957 following the destruction of the iconic Ebbets Field stadium. Poignant, unsentimental and deeply eloquent, Wait Till Next Year is a profound memoir about childhood and loss, baseball, and the power of sport to bind families and heal loss and reveal as metaphor the evolving heart of a nation.